Our target customers are SMB whom appreciate our specific approach towards usability and the functionality of Mancloud versus the operating cost. ManCloud offers an unseen flexibility. It's a real-time modulair platform that can be tailored to your needs. By offering the system as a service with a monthly fee, the investment is very limited and spread into time. Additionally, you can freely choose the hard- and software you use. ( PC, MAC, Linux, Windows ) Because ManCloud is web-based, you just need in internet connection on your device. ManCloud has a wide range of integrated modules that help you organise in to perfection. Comments: We are not an average Hotel and so none of the typical available hotel software suited our needs. ManCloud is the sole PMS that could digest all these parameters and automate my day to day operations to a maximum. The team behind the company where so helpfull and really stood by us every step of the way. So big congratulations to ManCloud for building such a versatile and reliable solution. Although we paid a additional fee for the extra customizations, it was all worth every penny ! The fact that it's all done through a web-based application makes it even more amazing. So if you're looking for a system that you can customise and adapt to your specific approach like we did, then you need to try ManCloud. 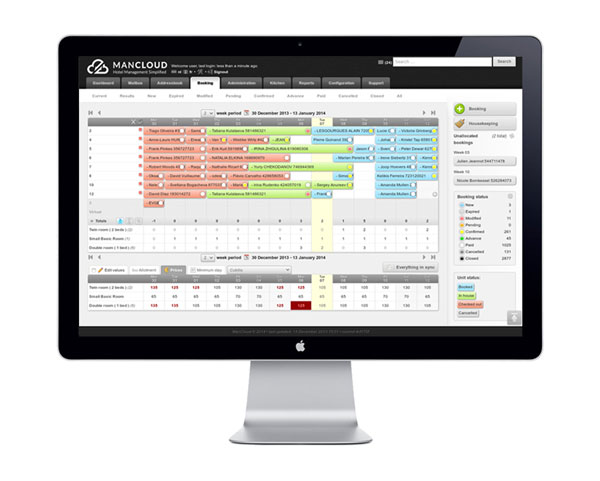 ManCloud thanks for simplifying my life as a hotelier ! Comments: With ManCloud i'am now able to manage my hotel from any place. The software excels in usability and easy of use. It is the most complete yet compact web-based PMS I came across during my search. It is beautifully designed and has all the buttons in the right places. The service and support is great and they are always their if you need them. I would recommend ManCloud to every Hotelier. Thanks to ManCloud I reduced my IT and operational costs with about 35%.